The purpose of the Alaska Association of Student Government (AASG) is to provide leadership training, communication, and a student voice of issues at the local, state and national levels. AASG (pronounced Ah-sog) includes about 150 member high schools all across Alaska. Collectively, local AASG programs serve over 25,000 young people in their home schools and state-wide. The statewide organization is led by a 17 seat Executive Board comprised of students selected for either one or two year terms. One of the students is the representative to the Alaska School Activities Association and two more are representatives to the State Board of Education and Early Development. The AASG Executive Board receives guidance and assistance from the Steering Committee, composed of the advisors of the students on the Executive Board. They are also the officers of the Alaska Association of Student Governments Advisors’ organization, AASGA. 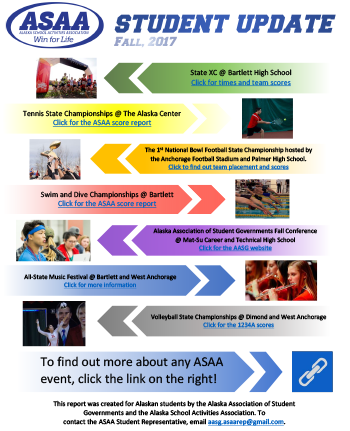 AASG is supported and sponsored by the Alaska School Activities Association (ASAA). 1. To provide a forum for student autonomy through a student-run organization. 2. To promote leadership, character, integrity, cooperation and unity across Alaska’s diverse cultures. 3. To promote student leadership and political action through statewide conferences. 4. To provide a collective voice for Alaskan students regarding educational, political and other pertinent issues. 5. To provide opportunities for member schools to experience responsibility, growth, and program organization by hosting an AASG conference. 6. To expose students to a variety of Alaskan communities and lifestyles by rotating the location of AASG conferences. 7. To provide forums for students to experience the benefits, issues, and pride involved with community service. In support of its goals, AASG holds two statewide conferences each year, one in the spring and one in the fall. Each are hosted by various member schools. During these three-day conferences, delegates from member schools attend general business meetings where issue-related resolutions are introduced, debated and voted on by the delegation. Student leadership-related workshops are offered throughout the conference. New officers are elected, awards are presented, and inspirational presentations are also delivered. Five hundred to seven hundred delegates usually attend the fall conferences, while spring conferences are typically attended by approximately two hundred and fifty delegates. Student Democracy Projects – AASG encourages participation in various state and national democracy projects, including voter registration, candidate forums, educating lawmakers, and mock elections. National Association of Student Councils (NASC) Participation – AASG sends a student delegation to NASC conferences each year where student leadership issues are discussed. Usually a pre-conference tour is included to extend the students’ experience in the location where the NASC conference is being held. AASG’s most important benefit is providing a voice for students in Alaska to let people know how the students feel on certain issues in the state. AASG creates young leaders in communities and schools by teaching them leadership skills and increasing their awareness of political issues and the political process. Students use these skills to increase pride in their schools and to promote and carry out positive activities in their school and communities.